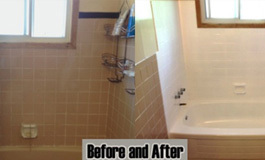 Tub surround tiles can easily be resurfaced in conjunction with resurfacing the bathtub or just by itself. The resurfacing process is very similar to what is done with bathtubs and sinks. The difference lies in the surface area being far greater and this means that more time, preparation and of course, paint, is required. There is no need to remove any of them. Therefore, there is no demolition mess. Can be done while resurfacing the bathtub or on its own. The grout is sealed and will not loosen or fall out. Mold or mildew can be easily covered up, removing any danger they may cause. Without any demolition mess, the tiles can be painted and sealed and will brighten up the bathroom in less time than if replaced. Things to consider before reglazing your wall tiles. Cracked, loose, chipped and missing tile, should be dealt with before being refinished. If there is any loose or missing grout, re-grouting should be done before the tiles are refinished. When door frames and towel bars are removed they leave holes in the walls or tiles. Ideally, they should be filled before the tiles are refinished. If the toilet is going to be replaced, it is best for it to be out during the refinishing and installed once the paint has dried. **Please note that there is no warranty offered for tiles. 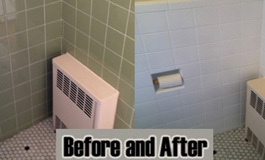 Tile resurfacing, bathtubs, sink resurfacing by Dr. Tubs Reglazing in Toronto, Ontario, Canada.